Writing anything from a school paper to a magazine article starts with a person’s life expiriences. All day long we write reports, presentations, marketing materials and blog updates. We do this now because in part it is our jobs but also because we enjoy it. When a person starts writing, most often at a young age, a blank piece of paper is not very friendly. Even if given a assignment to write about something, it is hard to start and usually encompases more than a beginner can think through. Interesting enough, most of the folks around the office started off writing small stories. Encouraged by either our teachers or family, they were nonsense bits that covered barely a half page of paper. Yet, cut up and folded they made up a book. Such is the world of a young mind. 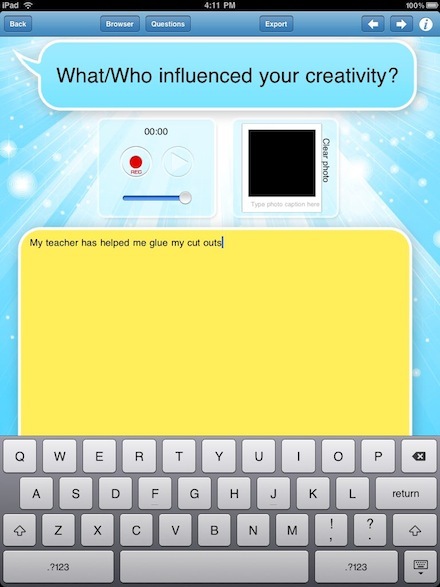 We came across a Free app today called Tappy Memories that seems to fit right into the world of getting writing started. It is an app that can be used by young and old to record the important things that are happening. The desire of the creator seems to be a resulting document an adult can pass on. In our eyes, it is a perfect instrument to encourge young writers to think about getting their thoughts down on a page quickly. … the Personal area starts you right in with questions about a person’s life, family members close and far. 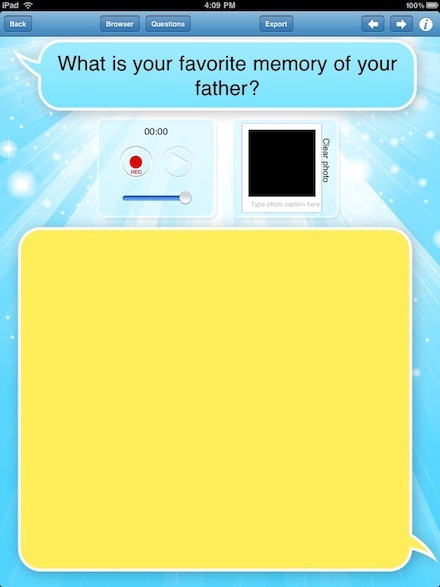 Tapping the arrows in the upper right corner changes the question and text box forward and back. The questions are perfect for an adult reflecting on days gone by and hopes for tomorrow. Too deep for your kids? It was for ours… non of ours could just go through the questions on their own – luckily Tappy Memories allow you to edit the lists of questions in each area. You can personalize more specific to your child’s friends, family and location names. 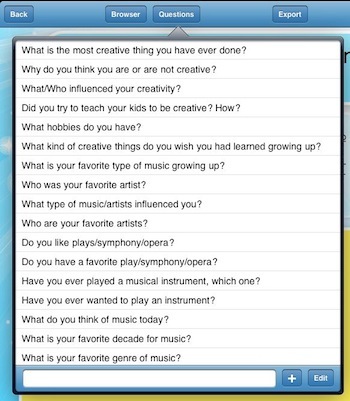 Here are some of the questions in the ‘Creative’ area. Again, editable if they don’t match up to what you feel are appropriate. It might just be fine tuning – “Did you try to teach your kids to be creative” to “Have you taught other kids to be creative”. Tap the yellow box to pop up the keyboard… then type away to say everything on your mind. If you can’t say everything you want to in words, just above the text box is an audio recording tool too. Next to the audio option is a picture frame. Tap to bring up a window to choose an image from the iPad’s camera roll. 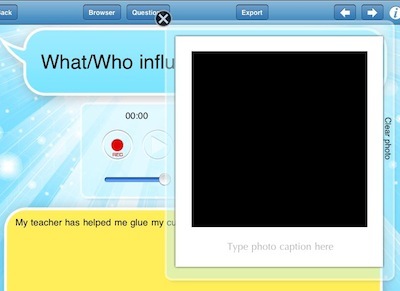 You can also add a caption to personalize. Tappy Memories helps with researching what your thinking too… reach out via a blank browser or look up in Google and Wikipedia. While we want kids to come up with their own writing, it isn’t bad to learn to look up a subject if it will help them get started. Finally, the app will allow you to add a password. Important in houses with multiple kids where one wants their writings to be private. No worries, unless it’s their diary, they will want to share the creations pretty quickly after they find the fun in writing.